In Outlook.com, you can use the search bar at the top of the page to search for email messages or contacts. If you cannot find an email, go to the Search box, type what you want to search for (a contact, subject, or part of a message) and press Enter. When you're done with the search, select the back arrow in the Search box or click any folder in the navigation pane on the left to exit the search. If you know the email has been sent, but you haven't received it, read Fix Outlook.com email sync issues. Start typing a name in the Search box. Choose from the suggested people in the list below the Search box, or press Enter to see more results. When you select a contact in the search results, you'll see a list of email messages related to that contact. To send a message to your contact, select Send email below the contact's name. To add the contact to Favorites, select next to the contact's name. If you often search for email from the same people, you can add those people to Favorites. To add the contact to Favorites, search for that contact, select their name in the search results, and then select next to the contact's name. To see all email messages from that person, select their name under Favorites in the left pane. 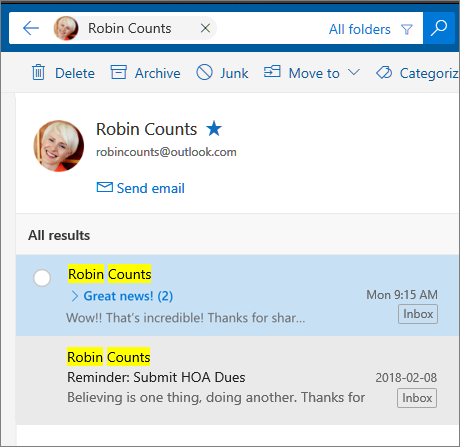 When searching your inbox, Outlook.com searches in All folders by default. Use the filter to the right of the search box to search in specific folders such as Deleted Items or Sent Items. You can also use the Search contacts, directory, and groups box in People to find contacts. In the Search contacts, directory, and groups box, type the name of the person, group, or resource you want to search for. If the contact you want doesn't appear in the suggestions list, press Enter to see the full search results. Refine your search by selecting Filter at the top of the results list. When you're done with the search, select the back arrow in the search box or select any folder in the navigation pane on the left to exit the search. Use Advanced Query Search (AQS) to refine your search results. In the search box, type an AQS keyword from the table below, followed by a colon and what you want to search for. For example, to find messages with a subject that contains “report,” enter subject:report in the Search box in the Outlook.com beta. Searches the To, Cc, and Bcc fields. Searches the date sent. You can search for a specific date or a range of dates separated by two dots (..). You can also search for relative dates: today, tomorrow, yesterday, this week, next month, last week, past month. You can search for the day of the week or month of the year. Important: Date searches must be entered in month/day/year format: MM/DD/YYYY. Searches for the date received. You can use the same search terms as for Sent. A search for HasAttachment:yes returns only emails with attachments. To further specify the emails you want to search, use words or names from the mail in conjunction with the search keyword. For example, blue hasattachment:yes returns only emails containing the word "blue" that include attachments. A search for HasAttachment:no returns only emails without attachments. A search for IsFlagged:yes returns only emails that are flagged. A search for IsFlagged:no returns only emails that are not flagged. When you use AQS, you can search on multiple search terms, including any, all, or an exact phrase. Subject:product plan will find any message with “product” or “plan” in the subject. Subject:(product plan) will find any message with both “product” and “plan” in the subject. Subject:“product plan” will find any message with the phrase “product plan” in the subject. You can also use AND or OR to search on multiple search terms. For example, you could search for messages from Jerri that include "report" in the subject by entering From:Jerri AND Subject:report in the search box. Use these tips and tricks to define more precise searches. Keyword searches are not case sensitive. For example, cat and CAT return the same results. When searching on a property:value expression, don't put a space after the colon. If there is a space, your intended value will just be full-text searched. For example, to: JerriFrye searches for "JerriFrye" as a keyword, rather than for messages that were sent to JerriFrye. To search for messages sent to JerriFrye, enter to:JerriFrye. A space between two keywords or two property:value expressions is the same as using AND. For example, from:"Jerri Frye"subject:reorganization returns all messages sent by Jerri Frye that contain the word reorganization in the subject line. When searching a recipient property, such as To, From, Cc, or Recipients, you can use an SMTP address, alias, or display name to denote a recipient. For example, you can use JerriFrye@contoso.com, JerriFrye, or "JerriFrye". You can use only suffix wildcard searches—for example, cat* or set*. Prefix wildcard searches (*cat) or substring wildcard searches (*cat*) aren’t supported. When searching a property, use double quotation marks (" ") if the search value consists of multiple words. For example, subject:budget Q1 returns messages that contain budget in the in the subject line and Q1 anywhere in the message or in any of the message properties. Using subject:"budget Q1" returns all messages that contain budget Q1 anywhere in the subject line. To exclude content marked with a certain property value from your search results, place a minus sign (-) before the name of the property. For example, -from:"Jerri Frye" will exclude any messages sent by Jerri Frye.